The Native American story of the Southern Indians. Learn about the culture, stories, and legends of American Indians and their famous chiefs, tribes and wars. A Native American story of the Southern Indians to teach kids about Native Indians in a short, enjoyable, easy to read format. A century and a half had elapsed since the invasion of De Soto, when the French began to explore the fertile regions watered by the Mississippi. Joliet, Marquette, and La Salle led the way in this adventurous exploit, the latter taking possession of its mouth for France. He named the country Louisiana, in compliment to the French monarch, Louis XIV. Being now intermingled with the French, and provided with arms, they attacked at the same time each his man, and in less than two hours they had massacred more than two hundred of them, among them Chopart, the commander of the fort—the cause of this terrible slaughter. To show their contempt for this man, the Indians would not permit a warrior to kill him, but for that purpose sent a "mean "person, who pursued the wretch from his house into his garden, and there despatched him with a wooden tomahawk. 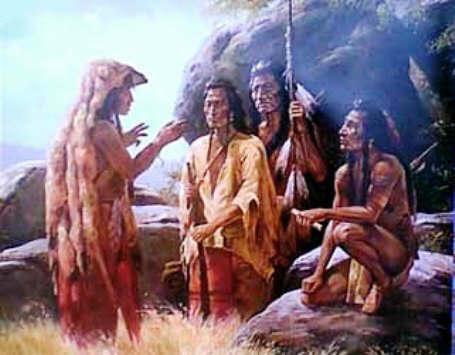 Two men only were spared—a tailor and a carpenter, whose services the Indians required. Some of the women were killed, others were made slaves, and treated with great indignity. The post at Yazoo was soon afterwards surprised and its garrison massacred. These Indians were of middle stature and of an olive color, but were generally painted. Their skins were stained with indelible ink, representing a variety of subjects. The women were tall, and symmetrically formed; their feet and hands were small and exquisitely shaped, and they moved with grace and dignity. The ears of the males were slit, and stretched to an enormous size—an exceedingly painful operation. They were very fond of dancing, spending almost every night in this amusement, and were skilled in getting up and preparing pantomimes, being excellent mimics. John Ross, their principal chief, strenuously opposed the removal of his people. He was a half-breed, and at an early age had acquired a good English education, becoming head chief in 1828. A portion of the Cherokees, under the lead of Major Ridge, Boudinot, and other influential chiefs, in December, 1835, concluded a treaty with the United States Government for the removal of the tribe to the Indian Territory, which was repudiated by Ross and the larger part of the nation. Under this treaty the Ridge party—one-third of the tribe—emigrated in 1837. Ross and the remainder of his people held out against removal as long as possible, but, notwithstanding a decision of the United States Supreme Court in their favor, were finally compelled to go. 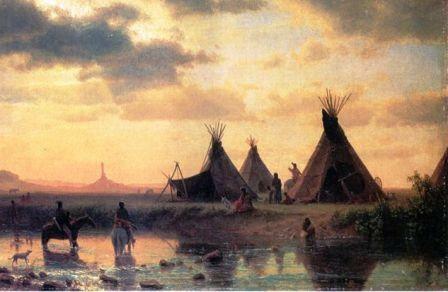 The removal of the tribe was disastrous to them in many ways, but they are at present in a prosperous condition in their new home in the Indian Territory. Among other odd customs of the Southern Indians was this—being sun-worshippers, whenever the head chief sneezed, his subjects bowed their heads, opened and closed their arms, and saluted him with these words: "May the Sun guard you," "May the Sun be with you," "May the Sun shine upon you," or "May the Sun prosper and defend you." The Native American Indian story of the Southern Indians provides an opportunity to read about the life and times of Native American Indians and many of their great wars, chiefs and famous leaders. A Classic Short story about Southern Indians for kids and children of all ages. This short story of the Southern Indians is great to read to kids and children enabling them to learn about history in a fun way. This very short story contains information about the famous chiefs of Native Indian tribes and their wars, battles and conflicts. This short Native American story has been selected to keep the attention of kids and children of all ages. Read our free short story online about Southern Indians. This free, online short story about the people of famous tribes Native American Indians to increase knowledge and understanding of the indigenous people of North America and the wars and battles they fought. The story of the Southern Indians. Discover the vast selection of pictures which relate to the Stories, History and Culture of Native Americans. The pictures show the clothing, War Paint, weapons and decorations of various Native Indian tribes that can be used as a really useful educational history resource for kids and children of all ages. We have included pictures and videos to accompany the main topic of this section - The Native American story of the Southern Indians. The videos on this website enable fast access to the images, paintings and pictures together with information and many historical facts. All of the articles and pages can be accessed via the Native Indian Tribes Index - a great educational resource for kids.